Tokyo 2020 have unveiled the official sport pictograms for next year's Olympic Games to mark the 500 days to go countdown. Organisers said the pictograms are in line with their promise of "innovation from harmony", with the designs aimed at subtly highlighting the characteristics and athleticism of each sport. The pictograms are also claimed to artistically highlight the dynamism of athletes. The Olympic pictograms were first used at the 1948 Games in London. They have become a regular feature since the Tokyo Games in 1964. Tokyo 2020 said the latest pictograms pay respect to their predecessors and are an innovation of those used when the Olympic Games were last in the Japanese capital city. The pictograms are aimed at helping to communicate the sports visually to an international group of athletes and spectators. It is claimed they will prove key in aiding the experience of athletes and spectators during the Games. The pictogram designs are claimed to be the product of nearly two years of work by a team, led by renowned Japanese designer Masaaki Hiromura. The graphic designer is considered a specialist in corporate identity and visual identity planning for museums, commercial facilities and educational facilities, as well as in signage design. "It is a real honour to have participated in the design of the Tokyo 2020 sport pictograms," said Hiromura, a guest professor at Tama Art University and representative director of Japan Creative. "I have tried to express the dynamic beauty of the athletes through these pictograms, while respecting the legacy bequeathed by the pioneers of the Japanese design industry in their designs for the Tokyo 1964 Games. "The 2020 designs took us almost two years to complete and they embody the thoughtful input of the many people involved. There are two sets of 50 designs - the free type and the frame type. The former will be used on posters, tickets and licensed products for the Games, Tokyo 2020 said. Frame type pictograms will be used for functional purposes, such as maps, signage at competition venues, guidebooks and on websites. Colour variations will be developed mainly using the blue of the Tokyo 2020 emblems and five other traditional Japanese colours. The colours - kurenai, ai, sakura, fujiand and matsuba – will be used to create points of difference, according to Tokyo 2020. A total of 33 sports will feature on the programme for the Games, with some having more than one pictogram. Cycling has five different pictograms for different disciplines, for instance, whereas sports such as equestrian and gymnastics also have different pictograms highlighting events within their programme. Baseball and softball has two pictograms as the sport prepares to make its return to the Olympic programme following its last appearance at Beijing 2008. It was one of five sports included on the Tokyo 2020 Olympic programme as additional sports, with the decision made by organisers and the International Olympic Committee. 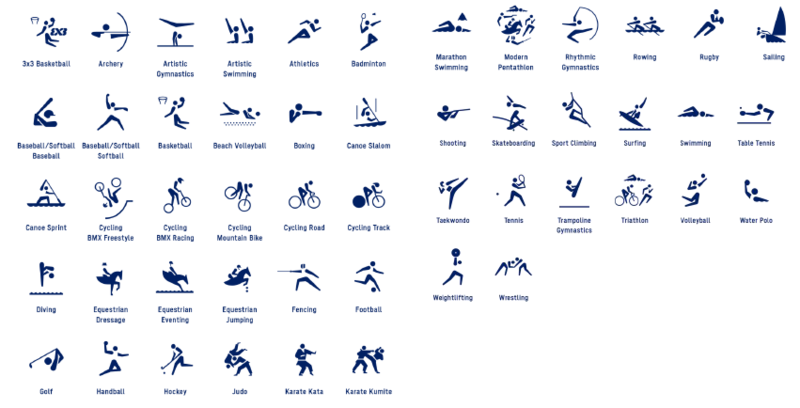 The first Olympic pictograms for the karate, skateboarding, sport climbing and surfing have been revealed, after the sports were also added. Pictograms have also been released for 3x3 basketball and BMX freestyle cycling. Both will debut at the Olympic Games at Tokyo having been included as new disciplines within existing sports in June 2017. The fences surrounding the Athletes' Village are set to be decorated with the sport pictograms in a effort to boost excitement for the Games. The project will be led by Tokyo 2020 gold partner Mitsui Fudosan, which is claimed to be the first in which decorations are installed around the city. A film has also been produced by Panasonic, a Worldwide Olympic Partner of the International Olympic Committee since 1985. The film is claimed to be provide a fun look at the Olympic Games through the use of significant numbers related to past Games. In addition to the Tokyo 2020 sport pictograms, the Olympic mascot Miraitowa and the number of competition venues are also introduced.